Check out our Gallery for recent around the farm and Show Event Pictures. 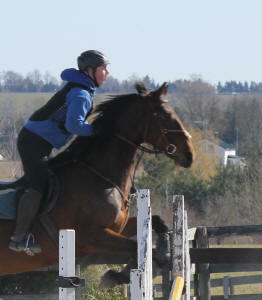 She is Stephen's new mount and we look forward to the 2011 eventing season debut. 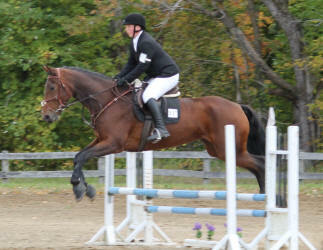 Prospect's Lillian and Stephen at Dreamcrest - Placed 5th - Dressage Judge comments "Elegant Horse". How far we have come - at the first combined trial of the Season Lilly only did w/t at her first dressage test and Stephen decided not to do Stadium - that was April 2011 at Grandview. 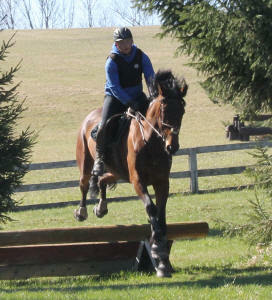 She did her first cross country schooling in June. Fast forward to October 2, 2011 - Grandview Fall Horse Trial - their third full event - Dressage score was 10% better than a month earlier, a beautiful stadium round and her third clear cross country. 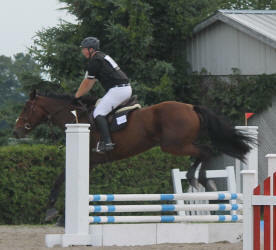 Prior to the last fence, Lilly slipped and almost went down - Stephen almost came off but she righted and he stayed on but lost his right stirrup - the last jump - with no stirrup - the reason he was riding a bit to the left. In all three events she did this season she did not have a single refusal cross country. 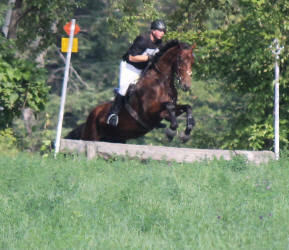 One run out stadium (rider error) and finished with a lot of confidence and skill to move up to pretraining next year. Stephen's Coach Michele Mueller was very busy with her Olympic participation in 2012 so most of the year was spent on lots of training in preparation for 2013. 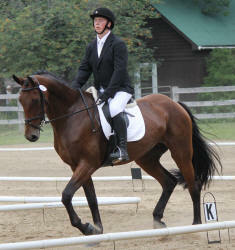 Sessions with John Hobson, Ian Roberts, Judy Hodgkinson, Peter Gray, Michele Muellerand lots of Dressage training with Karin Davis have prepared them well for 2013, when Michele will again be coaching this team. Prospect's Lillian at Glen Oro Combined May 5, 2013 - Pre-Training - Dressage - 41.3 Penalties and one rail in stadium but first complete Stadium at Pre-Training. over optimum time and no other faults - moving up 4 placings. cross country - within 1 second of optimum time. Prospect's Lillian completed her 3rd pre-training event yesterday - August 3, 2013 at Grandview - placing 6th out of 18 - finishing on her dressage score with her best test yet - a consistent and well ridden test with moments of brilliance. 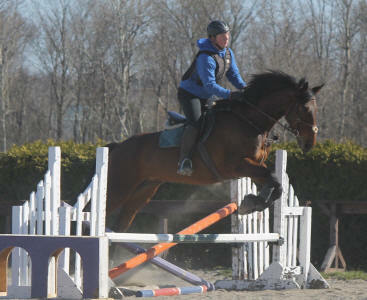 The stadium round was flawless with beautiful jumps and flying changes where needed. 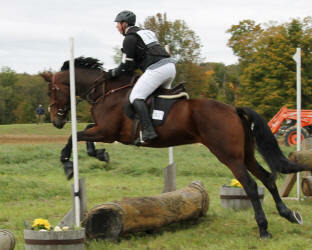 Cross country was executed with perfection and was just beautiful to watch - very impressive Stephen Hall. Prospect's Lillian at Lanes End - August 18, 2013- Finished 7th - great dressage, consistent stadium and wonderful cross country. The water monster has been totally conquered. Thank you Gloria McKim for these great pics. Prospect's Lillian at Dreamcrest - September 8, 2013 - interesting day at Dreamcrest for Lily and Stephen Hall 's debut at Training. A wonderful first Training Dressage test with some 7's, a nervous start to stadium but hit the grove after fence 3 and after that it was picture perfect. Cross Country Started out great up to 7 - the one he was worried about - a run out but over on the second time, a huge jump at 8 and unfortunately retired at 10. Made it half way through but all in all a positive first experience with some work to do, but happy with the day. Prospect's Lillian at Dreamcrest - June 22, 2014 - I am so proud of Stephen and Lilly. They are becoming such a great team. She was so calm today. They got three 7's on their dressage test - including on their canter circle, a picture perfect stadium - even Ian shouted - great round Stephen - and a very good xc - a branch contributed to a run out but other than that it was great and they still made optimum time - which means that Lilly easily has the gallop for upper levels. Their xc was completed in a beautiful rhythm. July 26, 2014- Grandview Horse Trials. Stephen and Lilly had their best dressage yet - with a few 7's, one rail in stadium and a beautiful if faster than PT Time cross country. Unfortunately the time was too fast and forgot the rule about walking at the end and a walk across the finish line caused 15 faults. However, confidence is high and an upgrade to training is in the near future. 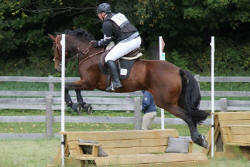 August 24 2014 - Lanes End Horse Trial ReportStephen and Lilly had a very exciting cross country at Lanes End today. 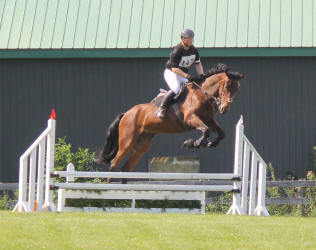 After jump 14 the left stirrup broke - so jumps 15, 16 a and b, 17, the water, jump 18 and the finish were done with only one stirrup. Stephen had little leverage to set Lilly up and it was all he could do to stay still and trust her to do her job - which she did - you can see the stirrup flying in the pictures. 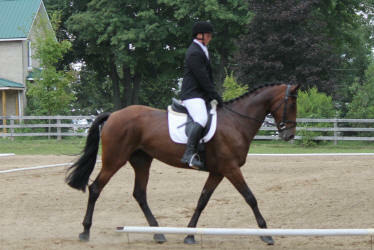 They also had a good dressage test - with a 8. Finished with a 7th. Prospect's Lillian and Stephen - Some great moments in dressage produced a test with some 7's and the nicest I have seen Lilly and Stephen all season - all be it a tough judge, a very spirited warmupand a few tough moments. Stadium on the grass at Dreamcrest saw a very twisty course that Sally Sanisbury put together and was handled to perfection by Lilly and Stephen - producing one of the few clear rounds. Ian Robert's Pretraining Cross Country course was the toughest we had ever seen and many riders were commenting on the challenge ahead. Very few clear rounds cross country - Stephen and Lilly ate the course for breakfast and even with some trotting came through 2 seconds too fast but with fantastic form and no jumping faults - placing them 13th out of a tough field of 26 to finish off their Pretraining Season. 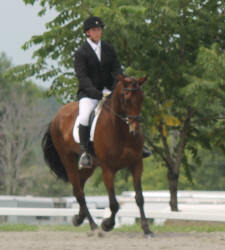 While dressage still needs a more consistent base, they are definitely ready to tackle training. April 26, 2015 - A great day at the Grandview Combined today. Best and most consistent dressage test yet - and 2nd training level - 6's and 6.5's across the board - and the most relaxed Lilly has ever been - Stephen was all smiles and thrilled with his test. 2 rails in Training Stadium, but not bad considering they have only jumped a few times all winter. July 28, 2015 - The worst rain we have ever seen for an event hit Dreamcrest this weekend. Stephen's second event at Training Level and we decided to pull out of stadium and xc since he had only had a chance to school once this year. The ground was saturated and many riders pulled out. 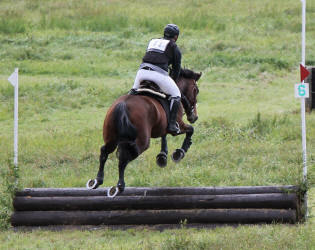 However, he had his best dressage ever with many 7's even though they were swimming through the ring. Scored 65.5% - 51.8 penalties. 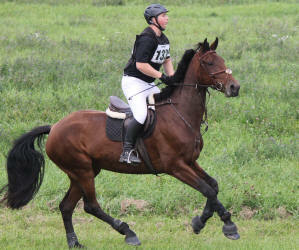 Many riders withdrew because of the conditions. July 6, 2015 - Lilly and Stephen went over to Dreamcrest today to school the training level xc since they didn't go at the show because of the weather. They had a blast and answered every question without issue. Oh Yeah!!!!! August 23, 2015 - Lanes End Horse Trials - Training - A relaxed dressage and their first clear Stadium Round. 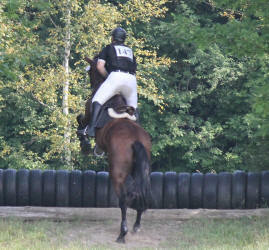 Unfortunately an unplanned dismount on fence 3 on Cross Country ended the day. August 30, 2015 - A great day for Stephen and Lilly at Dreamcrest Training Level today. Best dressage ever - 64% -53.3 penalties with 4 7's and a 7.5 - 2 rails in stadium and a great cross country over a very tough course - 2 run outs and still within time - so probably a little fast. They had a blast and are really starting to get their Training level legs in place. June 19, 2016 - great hot day at dreamcrest today for Stephen and Lilly. She was so settled today and the dressage test was fantastic except for one big bobble in the middle - and the confusion of the whistle in the next ring. Some 7's and the best test they have ever done. Stephen and Lilly had a great Stadium round - especially considering they have only had one session with Ian this spring. Two rails - rider error - but the most consistent round ever and it was just poetry to watch. Very pleased at how this team has matured. 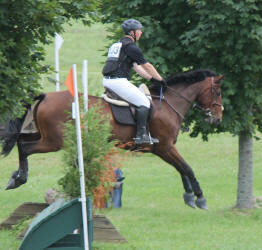 Last but definitely not least - their favourite phase of eventing - cross country. They were a finely tuned machine on cross country - needing to trot a little mid round to ensure they weren't over time and they hit the time bang on and had a double clear cross country round. So proud and even in the heat she came off the course looking like she could have done it again with ease. June 29, 2016 - Great day for my younger son and Lilly today too answering some training level questions at the schooling event at Glen Oro that were new for them. You can see how much they enjoy cross country. They finished 4th in the division. September 5, 2016 - Another fantastic schooling for Lilly at Dreamcrest today - looks like they are both ready for the event at Dreamcrest on the weekend. 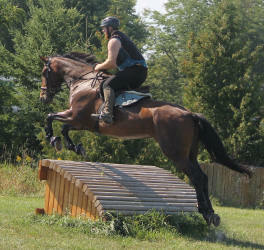 September 11, 2016 - Dreamcrest Horse Trial: Part of the sport of horses teaches us that there are ups and downs. After a fantastic dressage warmup and a great beginning to their dressage test, a bobble at A resulted in elimination for Stephen and Lilly. As a technical elimination, the TD permitted them to continue onto Stadium and XC as long as there were not any issues. While a slip in Stadium resulted in a couple rails, the balance of the round was flawless. Again XC - their favourite part of eventing, proved again what a great team they are becoming with a clear round -just a bit too fast - as they eat the course for breakfast. Disappointing for sure to be eliminated - unheard of for these two, it is definitely a learning experience. Onward and upward. XC pics courtesy of Gloria McKim. September 17, 2016 - So proud of Lilly and Stephen today. 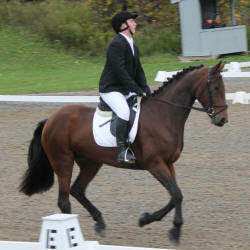 Last weekend's dressage proved problematic so we went to the RCRA Bronze show today. 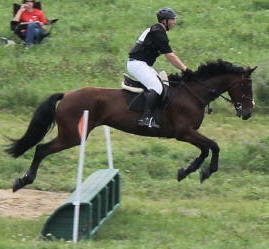 So accommodating that they let him do both Eventing Training tests. The first test went extremely well with 64.7% - they were both relaxed and the best I have ever seen them. The test had an 8 and 7 7's. with the judge commenting that there were some good moments. This was definitely a confidence building experience. Test 2 (the problem test last weekend) went even better notwithstanding the pouring rain. 65% - with 3 7.5's, and 6 7's including a first 7 for rider. Stephen was thrilled with their results today. Judge's comments - WELL DONE!!! October 1, 2016 - While my video taping skills need practice - Here is Lilly and Stephen at Grandview - 4th clear Training event. 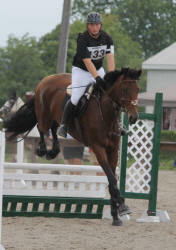 Ready to upgrade to Prelim next year. December 12, 2016 - Winter jump lessons with Ian today - Lilly seemed to enjoy the session. January 2, 2017 - Lilly and Stephen doing oxers and some added height.